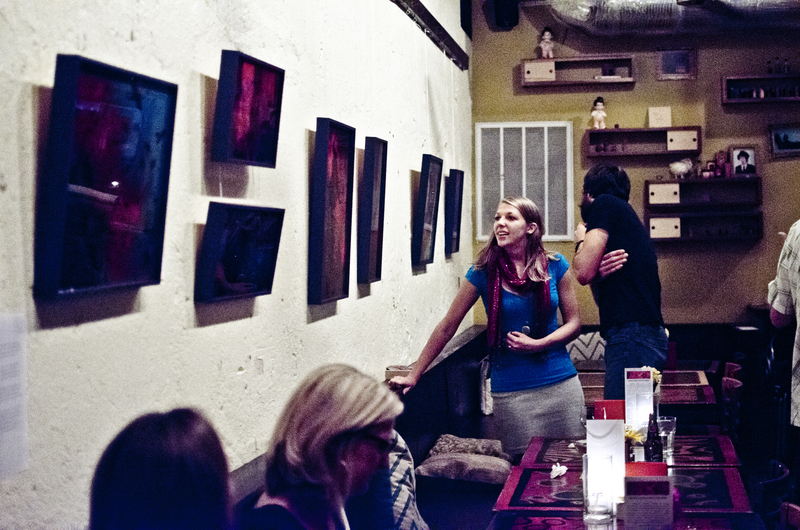 There is a certain beauty I have experienced in having the opportunity to exhibit my art in my own community. This last location was so close to my house I could easily bike or walk, giving me not only easy access to the physical space but a deeper access to the people who traverse the same streets that I do. Eager for this potential intersection, I also realized that it would require my intentionality to make the most of its unique setup. If I wanted to really engage my community, a door opened through my art, I would need to not only make myself accessible to those viewing it; but, go so far as to initiate the interaction. This desired outcome would call for some boldness on my part, which being of an artistic temperament doesn’t necessarily come easily. Exhibiting within the parameters of my own stomping grounds provided a unique connection to the viewers in a way I don’t always have the joy of experiencing. The opening night was such an encouragement as familiar faces kept coming through the door, making the room abuzz with conversations among people who either knew each other already or were just a few degrees from overlapping. I have learned through this experience that having such fruit materialize does take conscious effort on my part as the artist. I was more bold this time to personally invite people, not just friends and family who would come even if out of a felt obligation, but including acquaintances I had crossed paths with through various daily encounters; fellow artists, my kids’ school teachers, my daughter’s therapists, neighbors, etc. These relationships still in their infancy, seemed to need an extra little attempt to show my interest in knowing these individuals better. The exhibition offered just that kind of unique window to reach out and invite their world to overlap with mine. Some people might think that this act took arrogance, but on the contrary, instead of being over confident about my work, it was actually through my vulnerability that I took this step of faith. Let’s be real here. It isn’t easy to hang your heart on the wall and invite everyone you know to come see it. It requires you putting yourself out there, with no guarantee of a response. This boldness was fueled by my desire to engage my community through my art, sharing the hope and healing I have experienced. I consider it being emotionally accessible alongside being physically present. I was determined that the buzz of community didn’t have to stop on opening night, rather I could have the whole month of the exhibit to intentionally seek out people for further connection. Thus, our family coffee budget had to grow as I sought to invest it back into inviting certain people to the cafe with me for an art and caffeine fix. Some of these people were dear friends who hadn’t had the time to come to the opening, others were acquaintances who I just wanted to get to know better, and then there was one stranger who happened upon the opening and sought me out at the evening’s end. The environment was too busy and noisy for deep and long conversations so I asked if we could continue the chat by meeting again at the cafe another day. She easily accepted. I was pleasantly surprised just how positively people responded to meeting more personally. Sometimes we talked about my art, sometimes the art just served as a backdrop to conversations centered on other topics; sometimes light, sometimes heavy. My frequent visits back to the cafe also provided me ample opportunity to get to know some of the cafe staff by name; with a few even able to anticipate my cappuccino order before I opened my mouth. It has been ages since I have had such a richly social and fulfilling month. I hated to see it come to an end. As I was making plans to arrange taking down the work, we got a spontaneous request from a friend on the other side of the city who asked if the work could be moved to his church for the following month. The artwork, then came back home to the studio for no more than 24 hours before embarking on its next location. The accessibility can continue as I respond to such requests and seek out other opportunities to exhibit locally and kindle relationship. Well said. It’s such a good reminder that we do need to take risks and not just wait for opportunities to show up on our doorstep.